Peace Of Bread is one of those bands that I just can't believe I missed out on. They are so completely right up my alley, but I'm not sure I would have heard of them if it wasn't for the recommendation of Kazu from Waterslide records. I think one of the main reasons I was unfamiliar with them is that they were primarily active during the mid 2000s. A time where, for whatever reason, I just had a harder time keeping up with the Japanese music scene outside of Snuffy Smile releases. Peace Of Bread, in many ways, feels like the natural progression of what Cigaretteman would have ended up sounding like had they kept going.. With the sort of fast and catchy guitar work that brings to mind some of my favorite Snuffy Smile bands like Snatcher or Blew, the five songs on this EP are just unbelievably great. Every single song is just perfect with the right amount of energy in the verse that builds into toe tapping choruses. The alternating male/female vocals create an incredible dynamic where each singer is able to grab the spotlight for their portion, but the true magic hits when they come together with perfect harmonies. If you can't tell, I really love this EP. 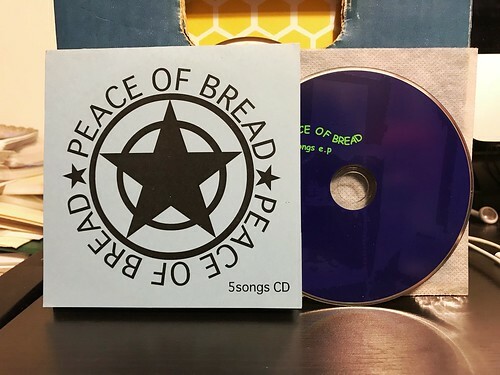 It looks like Peace Of Bread put out quite a few CDs and EPs over the years they were active. I hardly have any of them, but it looks like I'm going to have a lot of work ahead of me trying to hunt them all down. Maybe Kazu can help! I can't find any of these songs streaming online, but trust me, they're great.